It was 1940. Walter and Cordelia Knott had a farm growing berries and rhubarb along Highway 39, a few miles south of the little agricultural town of Buena Park, California. Their farm had something that others in the area didn’t have: an incredibly successful restaurant selling chicken dinners to families who drove down from Los Angeles. That year, Walter Knott began adding Ghost Town near the restaurant. He artfully arranged authentic historical buildings along with matching new construction. 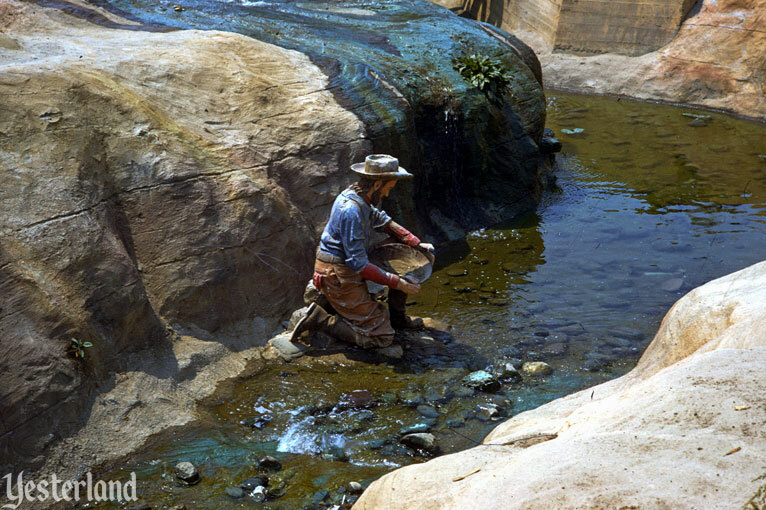 By mid-1941, visitors could enjoy a wild mining town of the Old West, full of delightful details. Although there was no charge for admission or parking, Ghost Town would make the farm even more of a destination. It was the beginning of Knott’s Berry Farm as arguably the first true theme park in the United States—and still one of the greatest. Knott’s is celebrating the 75th anniversary of Ghost Town this summer with a spruced-up Ghost Town, a restored GhostRider roller coaster, new shows, and an interactive entertainment experience, Ghost Town Alive! But this is Yesterland. So today you’ll find 14 never-before-published historical photos of Ghost Town from an earlier time—around 1958, give or take a few years. 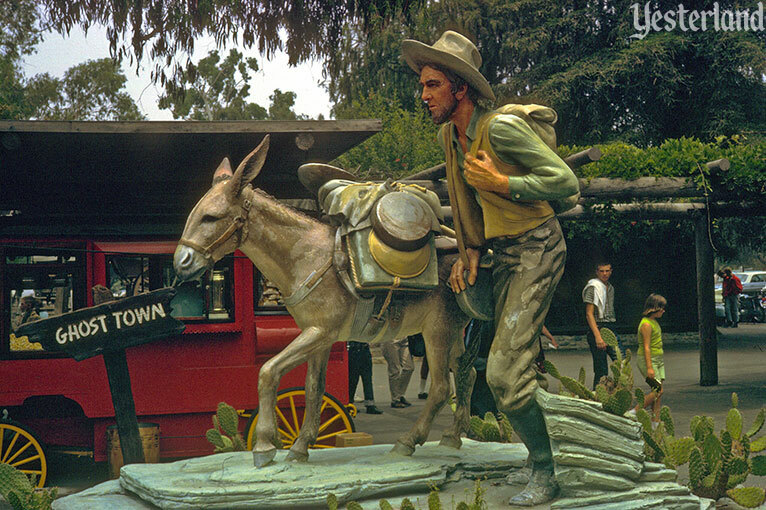 The sculpture of the miner and his burro is no longer at the entrance to Ghost Town. 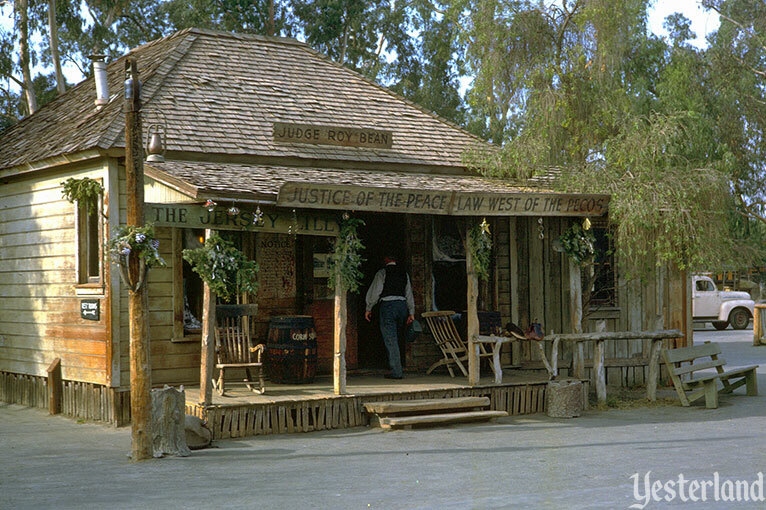 But it’s still at Knott’s—only now it’s at the corner of Beach Blvd. and La Palma Ave., on a high pedestal behind a wall and surrounded by large evergreen trees. Walter Knott hired an artist named Claude Bell to create statues for Ghost Town. 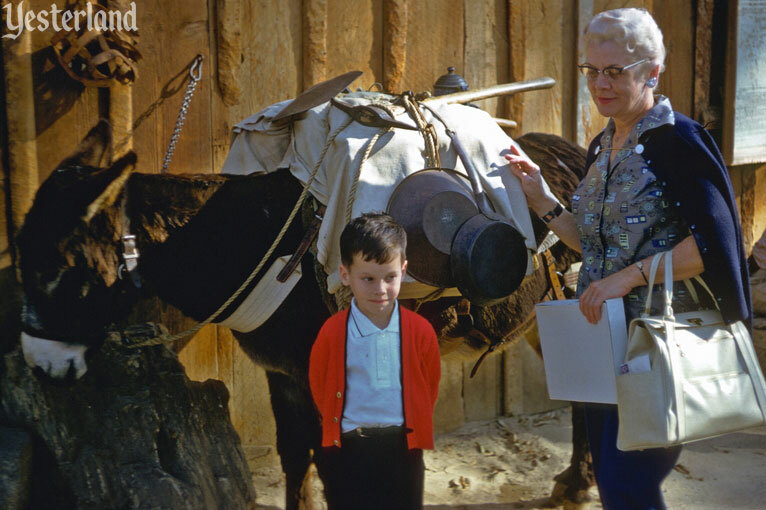 The statue of the miner and his burro was an icon of Ghost Town. 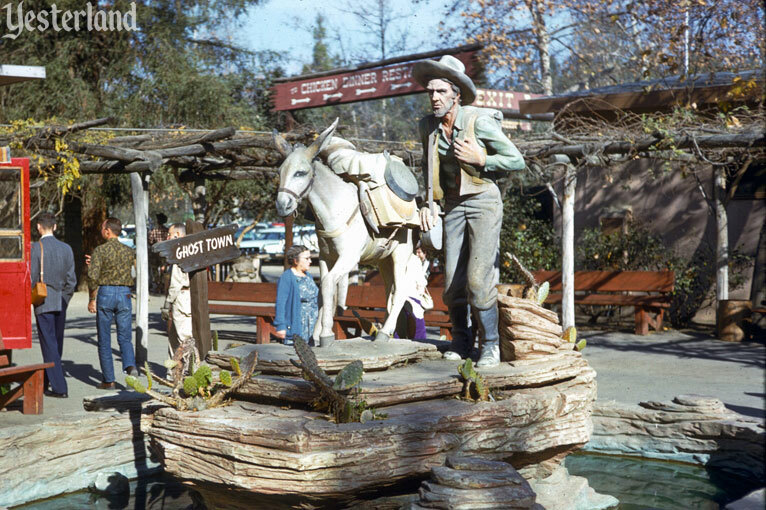 Bell’s best known work at Knott’s is probably the bench with Handsome Brady and Whiskey Bill. After retiring from Knott’s, Bell created the giant dinosaurs off Interstate-10 in Cabazon, California. 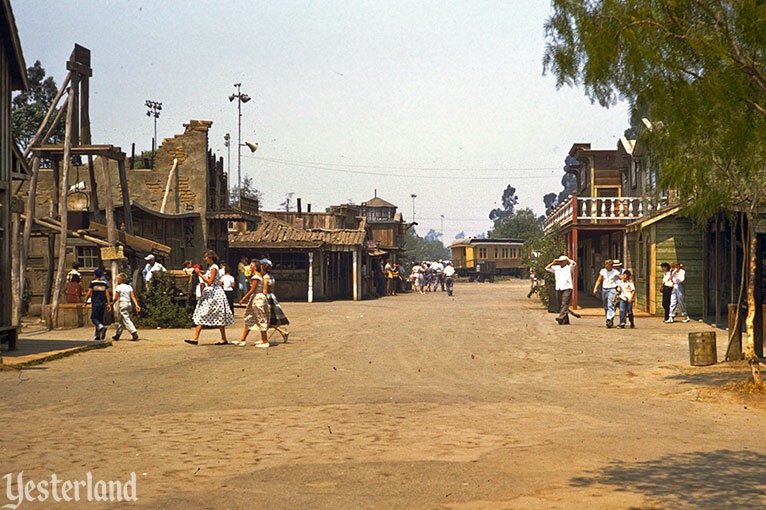 Before Disneyland opened with Main Street, U.S.A., Ghost Town already had a street called Main Street. It was home to the Ghost Town Grill, the Town Jail (Sad Eye Joe), the Ghost Town Blacksmith, the Post Office, and the Livery Stable—and that’s still the case today too. 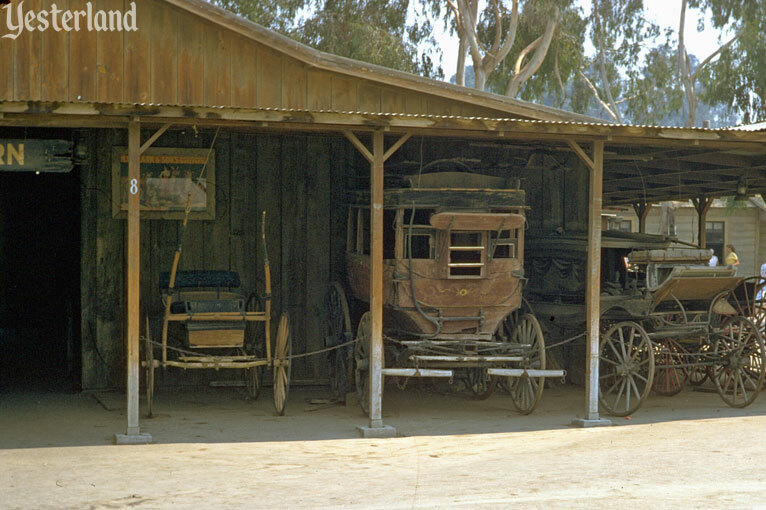 When these vintage photos were taken, the Livery Stable housed a collection of historical horse-drawn wagons, coaches, and hearses—with some inside and some outside the barnlike structure. 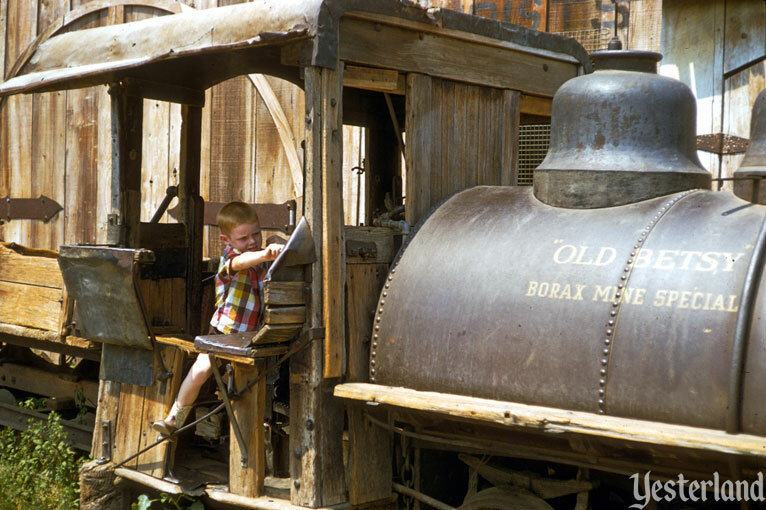 “Old Betsy,” a historical borax mine locomotive, is still there today, still adding to the Old West atmosphere of Ghost Town. The former Wells Fargo office, next door to the Post Office, is now the Main Street entrance to the General Store, the largest and oldest shop in Ghost Town. Schoolhouse Road begins at an authentic one-room schoolhouse that served the children of Mitchell County, Kansas from 1879 until some time in the 1940s. Walter Knott brought it to Knott’s Berry Farm in 1952. Heading north from the schoolhouse, the road ends at Calico Square. The schoolhouse, Schoolhouse Road, and Calico Square are all still there. But the view beyond Calico Square is now completely different. 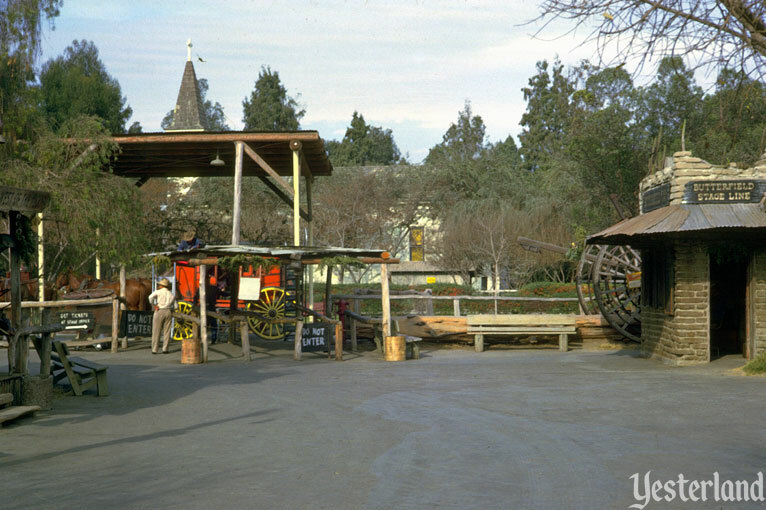 In 1969, the Calico Logging Co. log flume ride (now Timber Mountain Log Ride) became the focal point of Schoolhouse Road. And in 1998, Supreme Scream towered into the sky above the log ride as Orange County’s tallest structure. The surroundings of Boot Hill cemetery originally immersed guests in an Old West setting more completely realized than any other part of Ghost Town. Once the John Wayne Theatre (Toyota Good Time Theater, Charles M. Schulz Theatre) was built in 1971, the illusion was broken, despite a mural on the back of the building. Walter Knott built a replica of “The Jersey Lilly,” the saloon/courthouse where Judge Roy Bean, “the Law West of the Pecos,” is said to have “dispensed hard liquor and harsh justice.” The original is still in Langtry, Texas, and the replica is still in Ghost Town. 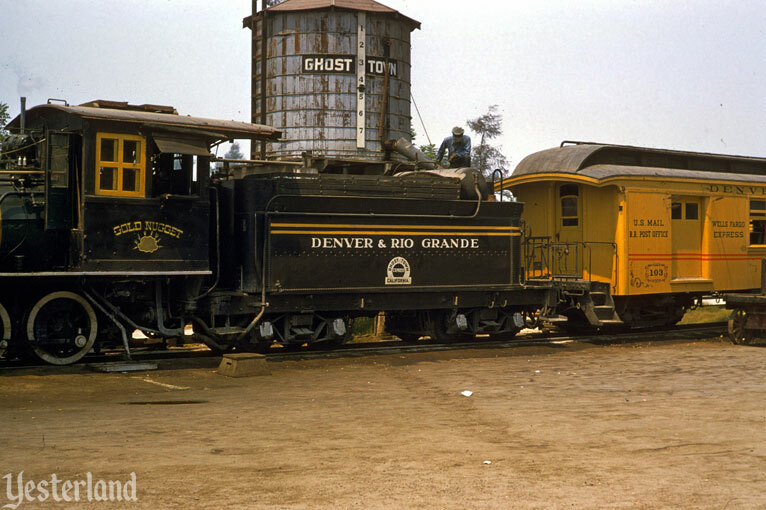 In 1951, Walter Knott acquired authentic narrow-gauge railroad trains from the Denver & Rio Grande Western Railroad, including two locomotives built in 1881 by Baldwin Locomotive Works. The ride opened in 1952. The photos above show one of the locomotives as it appeared six decades ago. 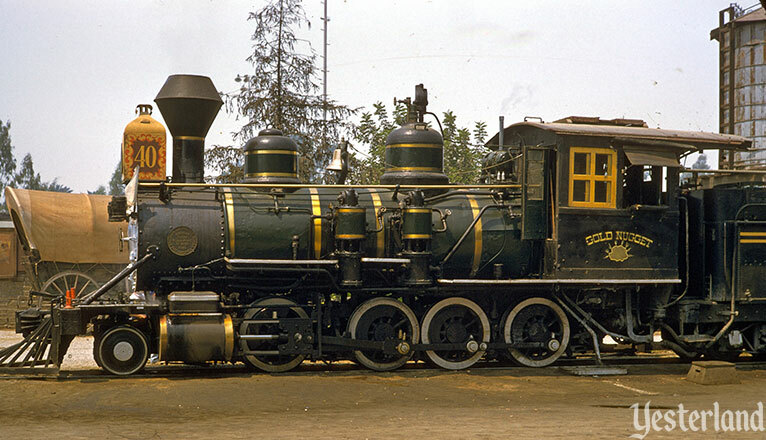 The name (“Gold Nugget,”), number (40), diamond smokestack, fancy lantern, and the paint scheme of coaches were changes made at Knott’s. The historic locomotives and coaches are still at Knott’s, only they’ve been restored to their original Denver & Rio Grande appearance. The locomotive in the vintage photos is now once again number 340. Using five historical stagecoaches and one replica, Knott’s Berry Farm still has stagecoach rides. The vintage photo shows the Church of the Reflections in the background, where the Silver Bullet roller coaster has been since 2004. 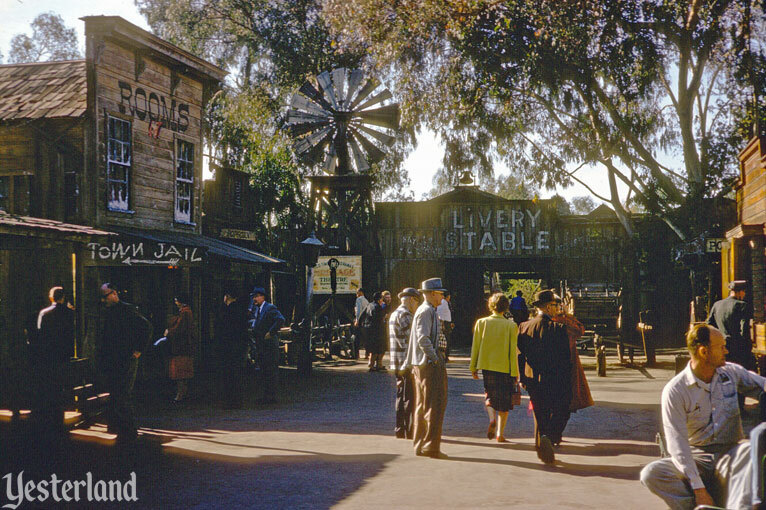 Much has changed at Knott’s Berry Farm since these vintage photos were taken in 1958 or thereabouts. Almost 60 years have passed. 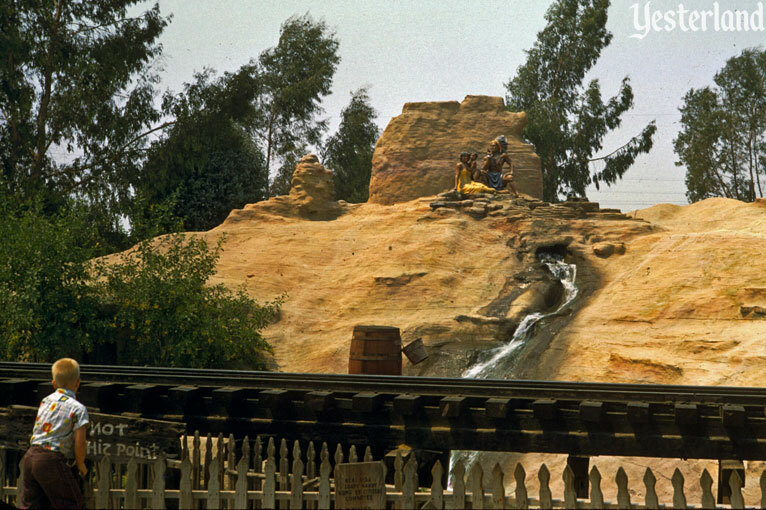 Although thrill rides have become part of the DNA of Knott’s, the heart of the park remains Ghost Town. 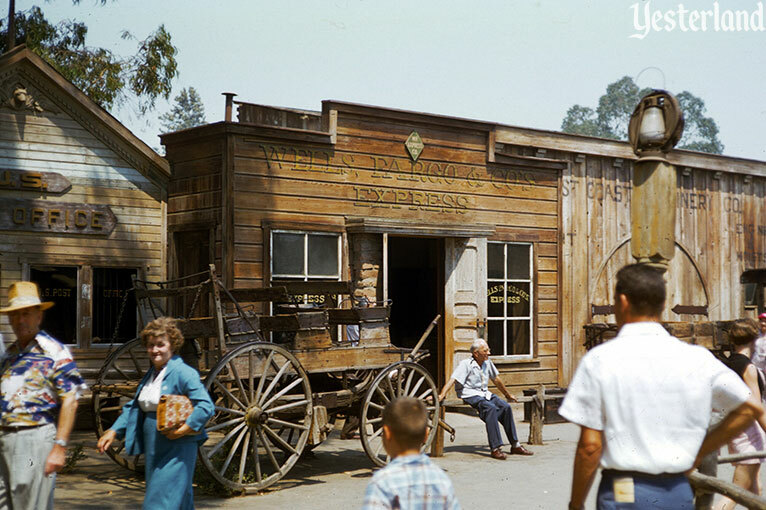 With Knott’s Berry Farm celebrating the 75th anniversary of Ghost Town, there’s renewed interest in the Farm’s heritage. 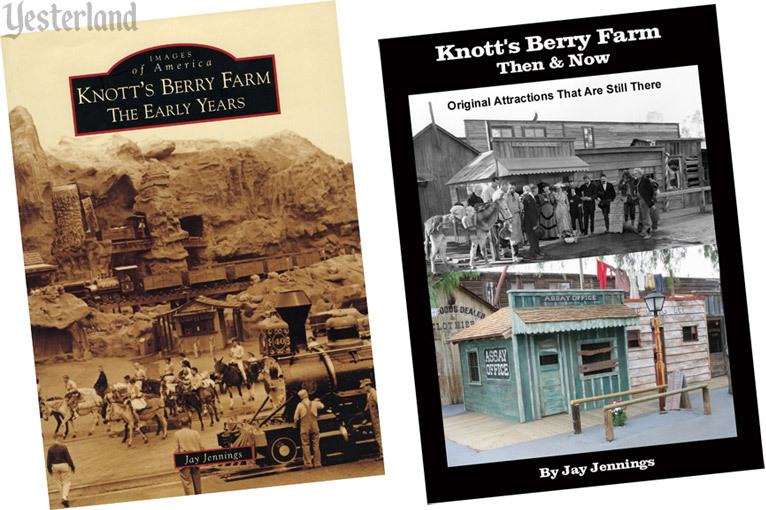 A recent Yesterland article, Knott’s Berry Farm, Then & Then & Now, highlighted the revised edition of Knott’s Preserved by Christopher Merritt and J. Eric Lynxwiler. There are two other books that you should know about—one traditional and the other electronic.